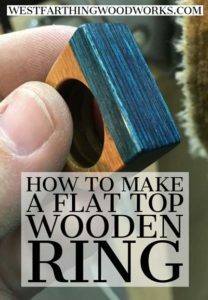 This is your complete tutorial on how to make a flat top wooden ring, with step by step instructions, and easy to follow directions. 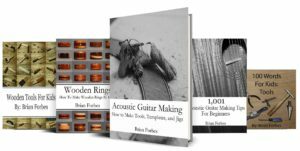 If you want to make a really unique ring, this is your guide. Enjoy. 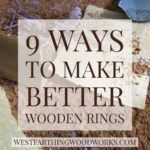 Most wooden rings are round, but you can make other styles too. There are so many other shapes out there just begging to be made into a ring. 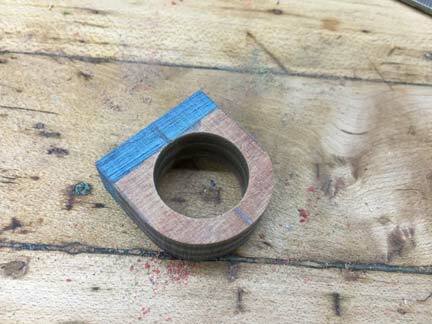 The flat top ring is one of the easiest, and a good first step in working with different wood ring shapes. The build itself is not that different from making any other ring that you have made up to this point. The only real trick that I will show you is how to position the drill bit so you can make the wood on the top pop out. 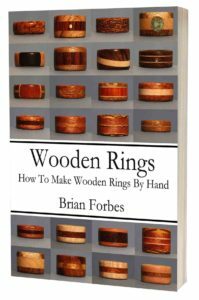 All you need are basic wooden ring making supplies, which you may already have, even if you are new to making rings. 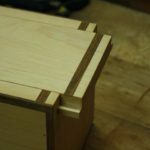 This is a woodworking project that does not require a lot of tools, so even beginners can have a really good time without spending a lot of money. Glue and wood for making the blank, and clamps for clamping it. A ruler and a pencil for measuring and marking. Drill bits (Forstners are the best) and a drill. A hand saw for trimming the excess. Files and sandpaper for refining the shape. A wipe on oil finish or a buffing setup for finishing. The wood for the top is the real show piece, so make sure to pick out a nice looking species that will be fun to flash around. You can use something really special like Koa wood, Ebony wood, or Briar. No matter what wood type you choose, make sure it really shines above the rest. 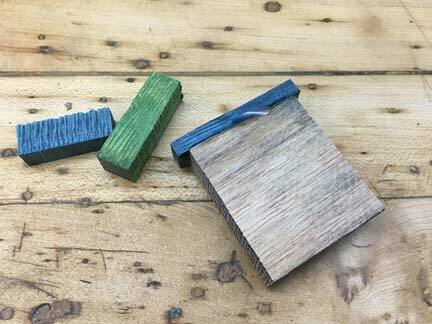 In this case, I am using Teekri wood dyed blue for the top, with a multi-color layered wood for the base. 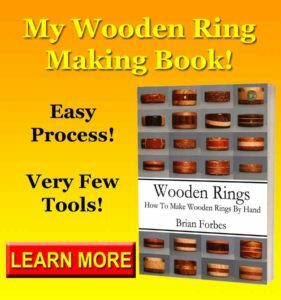 This can be used in rings for men and rings for women, friendship rings, engagement rings, and any other reason to make and give a nice looking ring. 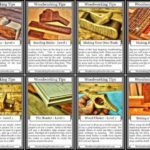 You cannot find Teekri wood for sale just yet. It’s a patented product that I have access to because of a consulting project I am involved with. The availability to the public might change in the future, but for now it’s not for sale. You can see more at Teekri.com. This is the secret to making a flat top wood ring pop with the design. You need to drill your finger opening so that the top of the hole is just touching the joint between your two pieces. 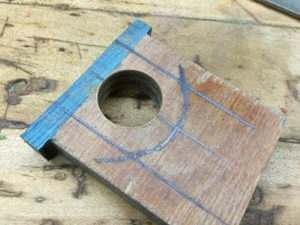 This is easy to do, all you have to remember is to divide your finger opening diameter by two, and that’s how far down from the joint to make your mark. Start by drawing a vertical line down the middle. Then, if your finger opening is 3/4 inch, measure down 3/8 inch (which is half) from the place the two woods meet. Make a line perpendicular to the center line, and this is your drilling mark. 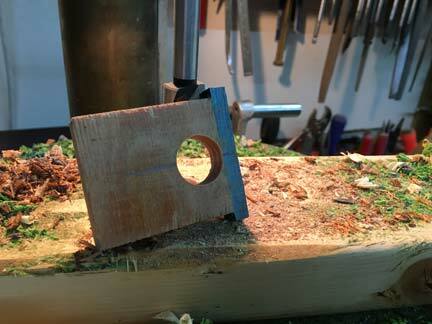 The easiest way to drill your ring blank is on the drill press. However, a hand drill will work just fine. Chuck the appropriate drill size into either tool, and prepare to make the finger opening. It’s important to use something under the wooden ring blank to prevent blow out. 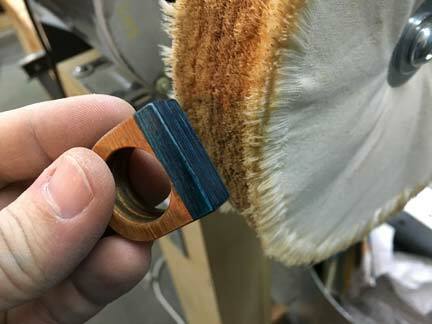 The more you can protect the ring blank, the better, and the less sanding you will have to do in the future. Drill carefully, and make sure to drill as straight as possible if you are not using a drill press. After you have drilled your wooden ring, you then need to mark out the shape. This is all up to you, and you can make this your own at any point in the tutorial. This is the roughing out stage, which means you are going to remove the bulk of the waste material, and leave yourself with something close to a working shape. In this case, mark the ring with a couple straight lines that are 1/4 inch from the outsides of the finger opening on each side. Then, draw a curved line the same distance from the opening around the bottom. This is your basic shape. Once your shape is marked out, it’s time to remove the bulk of the waste material. This is done the easiest with a hand saw, or a band saw. Follow your marks, and be careful. Make sure that you are getting very close to the lines, but not going over them. The goal is to remove a lot of material quickly, but not to remove so much that the future shape of the ring is compromised. It does not have to be a work of art at this point, just remove the stuff you don’t need. This is where having some power tools does come in handy. However, you do not need to have them in order to do this project. Done by hand it will take longer, but you can just as well get the same results. If you have a belt sander, use the tool to remove material and refine the shape. 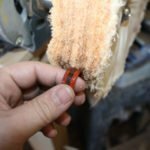 Work carefully, because the belt sander can take a lot of material off really quickly. It can also remove skin really well, ask me how I know. Work the piece until you start to get really close to final shape. If you are doing this part by hand, clamp your ring and use a coarse file to remove material. When you get closer to final size, switch to a smoother file. Once you get your shape the way you like it, switch to sandpaper and continue improving the surfaces. Start with a more coarse grit like 100 or 150, and this will allow you to remove material quickly. 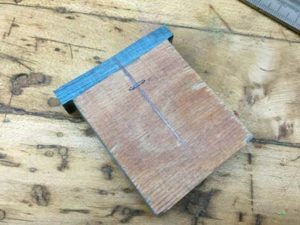 Break all the sharp corners with the sandpaper, and be careful not to chip out any of the wood fibers on those corners. Work your way through the grits until you get to the finer grits like 220 and 320. If you are finishing by hand, get the ring down to 320, and make sure there are no scratches. If you are buffing, 220 will work, but 320 will be easier. The easiest way to finish your ring without any equipment is with a wipe on oil finish. These are super common, and you can find them in a lot of different stores. One of my favorites is Tru-Oil, and even if you have never finished anything before, it’s easy to learn. Tru oil is an oil that goes on like an oil, but sits on the surface like a varnish. The product is super easy to apply, and you can find it in any woodworking store. All you need to do is apply really thin coats, and let the ring cure. Here are my Step by Step instructions for Applying Tru-Oil that you can follow. I promise that you will love the stuff, and you will end up finishing a lot of your projects with it. I have used it on everything from tools to guitars, and it’s never let me down. 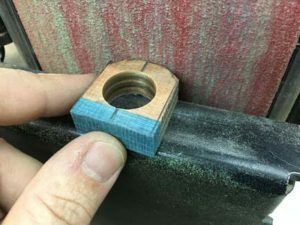 If you do have a buffing setup, or you can buy a small buffing wheel and some Tripoli compound, you can buff your ring instead of applying an oil finish. The beauty of buffing is the look, and the fact that you can handle the ring immediately when you are finished. Apply some Tripoli compound to the wheel, and bring the wooden ring in to make contact. Keep the contact brief, and move the ring so you hit different parts of the surface. As you work, the Tripoli acts as a polishing abrasive, and makes the surface shiny. What you are doing is sanding, but on the very fine level. This is called polishing, but it’s the same process as sanding, just with a really fine grit. If you do not own a buffing setup, and you make a lot of small projects, you will fall in love immediately once you own one. I waited too long to buy mine, and I really love how fast I can finish my projects. I hope you enjoyed the tutorial on making a flat top ring. 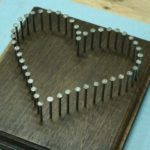 This is a pretty straight forward woodworking project, and it can make a personal gift, or a unique wedding ring. 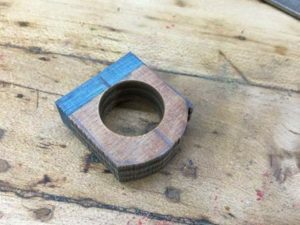 The custom wood ring is easy to make, and you can do it in a couple hours if you have a few tools. Make sure to pick out a nice piece of wood for the top. 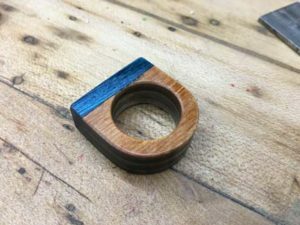 This is the single best way to really make your wooden ring design stand out. The bottom is important too, but the top is what everyone is going to see. Since the pieces of wood are so small, you can invest in something that might normally be outside your comfort range for price. You may have to spend a few dollars on the small pieces, but you can make a really unique ring. When you look at the ring from that perspective, it makes buying a little nice piece of wood an easy decision.